Here is Peter T. with is his prize winning tree (Midori Bonsai Club Show two posts down). It was hight time for repotting, because a tree well taken care of puts out lots of roots. The picture below shows a good job of placing branches. When you go to bonsai shows, you can learn a lot about the skill of the artist by looking that the branch placements from below. Bonsai before lunch: Below, same bonsai after lunch. What do you like better, all the flowers or a bonsai on its way to refinement? On the hands-on-part of the test, you are given a tree – that might be a little over-grown, that you must totally refine and wire. It was also time to de-foliate this Japanese maple on a rock. Below, the tree is done. Boon was pleased with Sue’s work – and she looks pleased too. The Maple is was placed under the 30% shade-cloth and will stay there until the new leaves harden off – then it will be re-introduced to full sun again. Click on picture for a closer look. Below you have an example of a tree being re-potted into Boon’s soil and growing for four weeks. The roots are going wild! But don’t expect these results unless you live in Florida or similar climes. The intensive students just flew in from points across North America. Henry flew in from Florida. 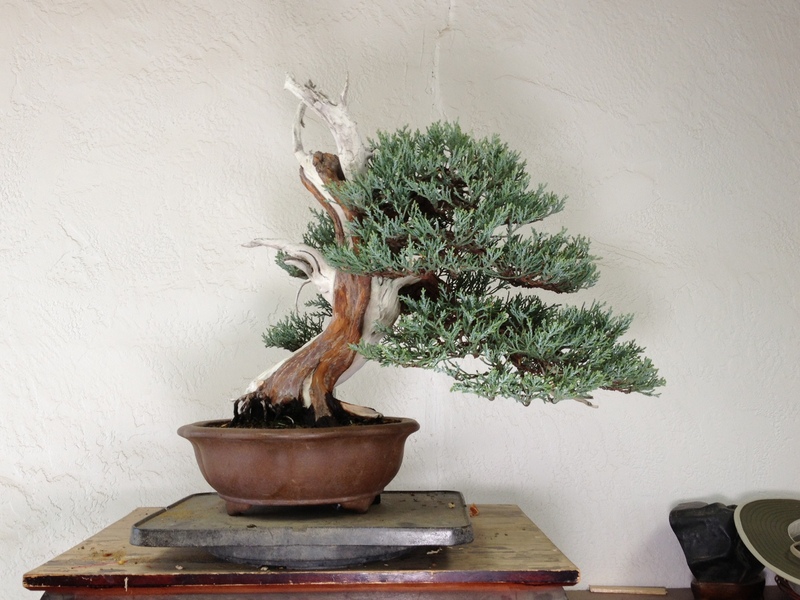 Here he has finished the first wiring on a Western Juniper. ..and it looks like he is eyeing the needed jin-work on the apex. Like the first styling of many trees, it looks a bit bare. But one great quality of a Western Juniper is that it will fill out and become full in a relatively short time.